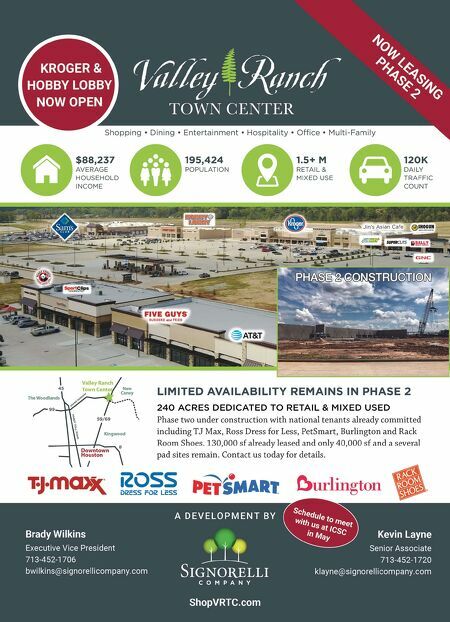 AVISON YOUNG 260 • SHOPPING CENTER BUSINESS • May 2017 I t's perfectly fitting that one of the world's fastest-growing real estate services firms also boasts one of the industry's most admired retail practice groups. According to Atlanta-based Avison Young Principal Spencer Bomar, who was instrumental in assembling and building the Canadian-based firm's U.S. retail ser- vices group, the astounding growth — the firm has expanded from an initial team of four people to more than 100 dedicated retail professionals in just six short years — is directly attributable to the vision of Avison Young CEO Mark Rose and his pledge to invest the necessary resources required to fuel that growth. "From day one, our senior leadership has been firmly committed to our U.S. retail practice," says Bomar. "Whether it was securing a highly visible booth to ensure success at our very first RECon in 2011 or the strategic acquisition of more than 30 industry-leading entities over the last six years, we have not only talked the talk, but we've backed up our ambition with meaningful investment and measur- able results." Avison Young's U.S. retail practice be- gan in Atlanta and was quickly followed by its second office in Chicago. While to- day the practice is highly active on both coasts, the Midwest and in the South, Avison Young's retail services team con- tinues to expand nationwide, and has established itself as a national (and inter- national) force. "We are committed to building and pro- moting our brand," says Bomar. "There was a time during the early years of the practice when we were doing truly great work, but our visibility had not yet caught up to our reputation." Bomar adds, "We had the assets, the resources, the expertise and the expe- rienced professionals, but people out- side of our clients didn't know who we were, and more importantly how we are different." Today, however, "That has all changed." The company's retail team has earned an international reputation for creativity and innovation, and its aggressive growth has been supported by the overall accelera- tion of Avison Young's universal brand. Founded in 1978, the company com- prises approximately 2,400 real estate professionals in 79 offices. Avison Young provides investment sales, leasing, adviso- ry, management, financing and mortgage placement ser- vices to owners and occupiers of office, re- tail, industrial, m u l t i - f a m i l y and hospital- ity properties in 71 markets across North America and around the world, and currently has more than 100 million square feet of space under management. A 2008 merger made Avison Young Canada's larg- est independently owned commercial real estate services company and prompted a wave of international expansion. Since 2009, the company has opened new offic- es in Canada, the United Kingdom, Ger- many and Mexico, and has established a market-dominant presence in 48 U.S. markets. Bomar, whose two-decades-plus long career included successful senior lead- ership positions with Staubach Retail Services, North American Properties and Transwestern before joining Avison Young in 2011, points out that while the practice's geographic diversity is an asset, Avison Young's retail growth has been primarily fueled by strong client relation- ships — and by the team's ability to deliver results. "People and companies trust us," says Bomar. "And, they are rewarded for it." Bomar's own client list includes famil- iar national names like Target, The Home Depot and Barnes & Noble. Growing Practice Creativity and acquisitions fuel Avison Young's growth in the U.S. Randall Shearin Spencer Bomar Principal Avison Young We had the assets, the resources, the expertise and the experienced professionals, but people outside of our clients didn't know who we were, and more importantly how we are different.